The meaning of place has a special hold on the Australian psyche. Perhaps it is due to the fact that the arrival of European settlers is recent in terms of world history and the decimation of the native, aboriginal cultures so complete. The founding of Melbourne only dates back to 1835, nearly fifty years after the establishment of the first settlement in Sydney. A mere 179 years ago, this city was an illegal squatter’s camp on the banks of the Yarra River populated by Tasmanian adventurers looking to exploit greener pastures to the North. Now, the city of Melbourne is “up itself,” that peculiar and charming Aussie expression meaning to think highly of one’s station in life. Melbourne is singled out every year by the Economist magazine as the best place in the world in which to live. Recent immigration has favoured Melbourne over Sydney, the city that put Australia on the world map. 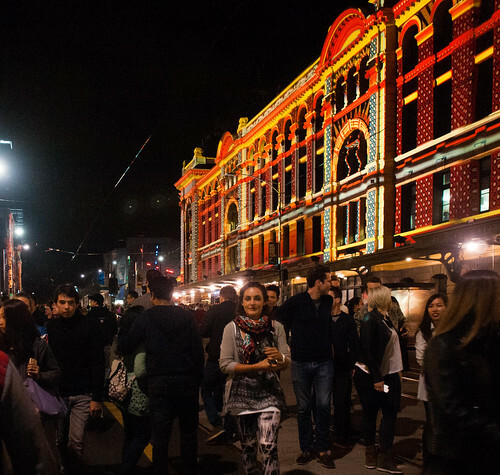 Melbourne hosts festival after festival, sometimes in the same week. The Melbourne Food and Wine Festival started February 28 and lasts for another week. 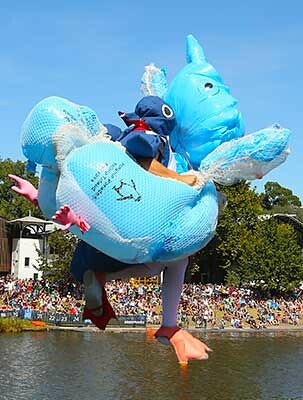 Yesterday was the first day of this Labour Day weekend’s Moomba Festival, an event popular with families thanks to its longevity (60 years), its parade, fireworks and hilarious “Birdman” competition. The Australian Grand Prix competition takes place next weekend with its crowds, screaming engines, squealing rubber and pungent smell of fuel. The event that captured my attention is called, simply, Melbourne Now. It is a challenging and fascinating look at the city through the eyes of its artists. 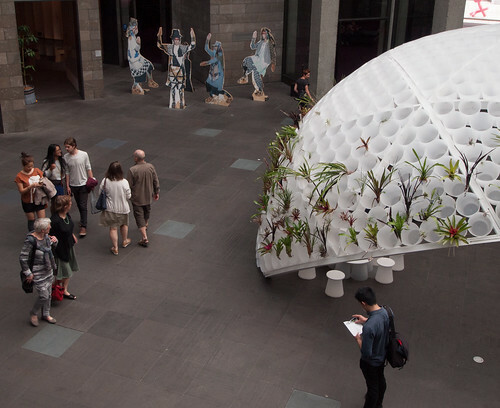 The exhibition spans both the National Gallery of Victoria (Australia) and the NGV International. 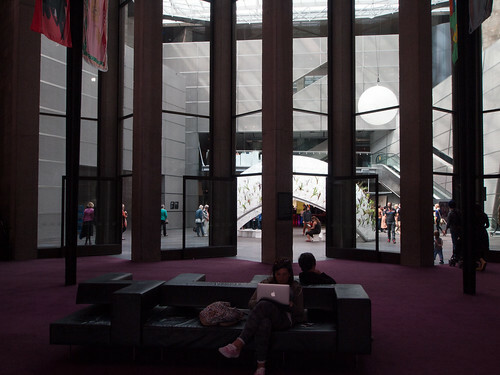 It is a sampling of design and art as well as an aesthetic look at the city as place and performance, an urban area that is geographically specific and yet globally enmeshed. 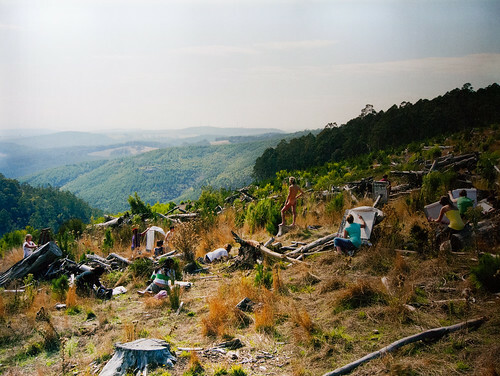 From the tiny village of squatters, Melbourne has never stopped growing, now covering a vast area larger than the combined size of Moscow, Paris and London. Despite the strain, Melbourne is still serviced by trains, trams and buses, although it is increasingly congested at “rush hour”, overrun with automobiles. 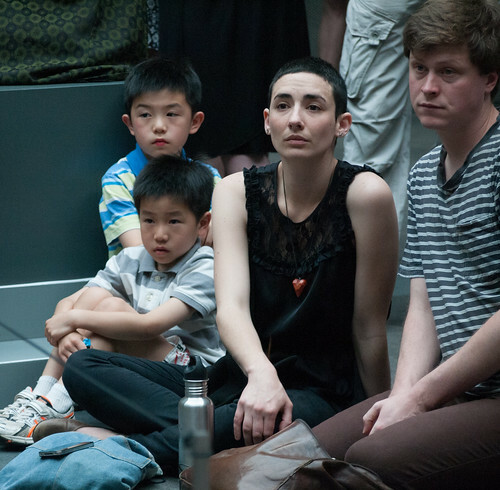 I was captivated by one long video installation piece– a DVD by a New Zealand artist named Daniel Crooks. It is called “An Embroidery of Voids.” He takes the celebrated alleyways of Melbourne as his theme and welcomes us on a magical journey through the lanes in dreamlike sequences that never seem to end. It is one seemingly coherent tracking shot, splicing and rearranging familiar environments into a haunting vision of the everyday transfigured into something new, altogether surreal. 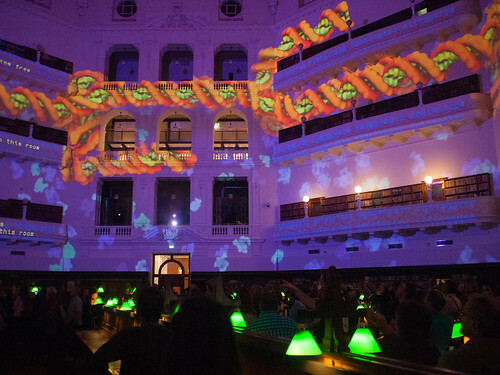 Other artists are playful, documenting performance pieces with hoola hoops or the release of 10,000 paper airplanes in the reading room of Melbourne’s State Library, a venue I visited in the last post about White Night. Charlie Sofo’s video of “33 objects that can fit through the hole in my pocket” brings us up short with its crisply humorous look at all the things that we live with, and often lose. 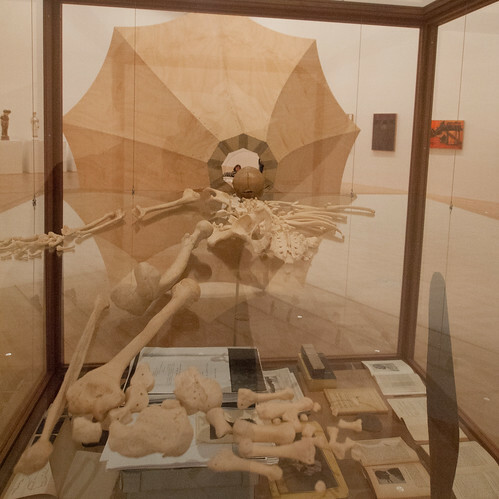 Brook Andrew’s “Beyond Tasmania, 2013” invites us to contemplate the extermination of the original Tasmanians and the display of their skeletons in support of questionable theories about evolution and eugenics. 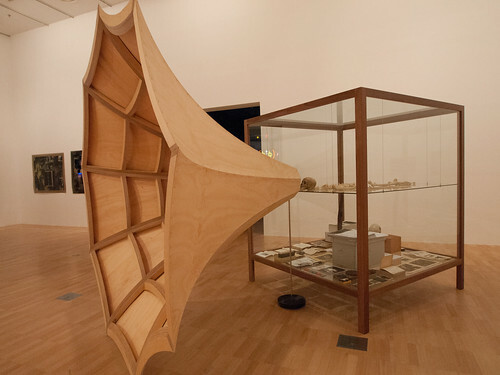 A wooden sculpture gives the skull a symbolic gramophone, one last chance to be heard. Siri Hayes captures the self obsession of our species with a stunning, staged photograph inspired by the French Impressionists and the Romantic landscape paintings of Caspar David Friedrich. In her work, plein air painters ignore the devastation around them, drawn only to the naked Adonis on display. 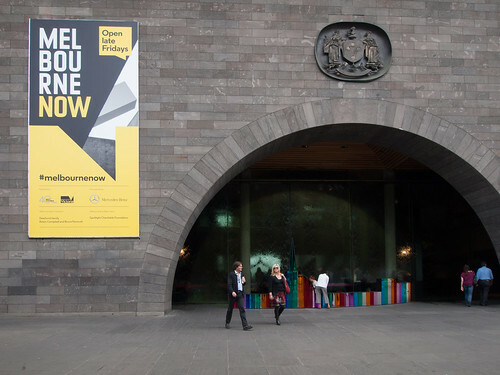 Melbourne Now is a brilliant and fascinating exhibit, entirely free and on for two more weeks only. If you don’t live here, there is an ebook you can download or view on-line. Check out my pics on Flickr by clicking on any photo running alongside this post. 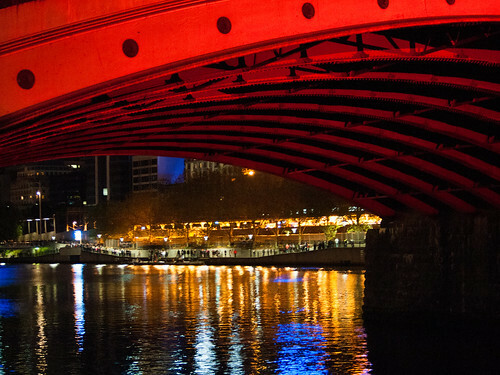 The distinctive architecture of Melbourne took on bizarre and beautiful hues Saturday night. 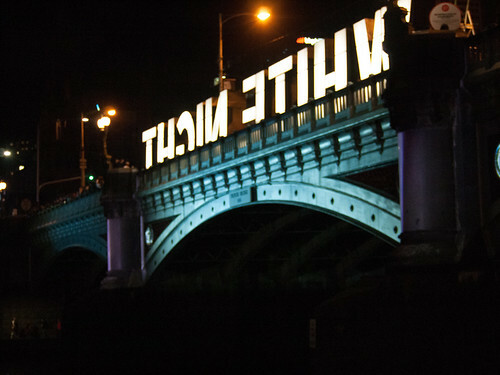 It was the second annual “White Night,” Melbourne’s take on the concept that started in St. Petersburg, spread to Paris, then on to dozens of other cities. White night generally refers to the days in the upper latitudes which are are longest during the days around the summer solstice. 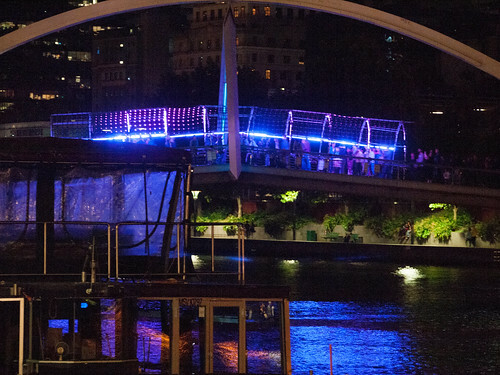 In Melbourne, the night was every colour that the prism has to offer except white, splashed on to Victorian era buildings and bridges as well as trees and water and sky. It was a night when three hundred artists were busy with their technicolor paintbrushes and one eighth of the city came out to play. This city’s White Night event started last year and attracted millions, so this year they decided to spread out the venues. Yours truly was not up to the task of visiting all one hundred sites or even close, but you are welcome to read a good account of one reporter who made a valiant time to dance the night away. Check it out before it disappears. http://www.theage.com.au/victoria/the-success-of-melbournes-white-night-festival-shines-light-on-serious-art-20140223-33aeb.html. After a long but orderly queue, I was fortunate enough to get into the rotunda of the State Library for a fascinating display of various viruses projected around the octagonal room with information on the status of the virus as a killer, past and present. 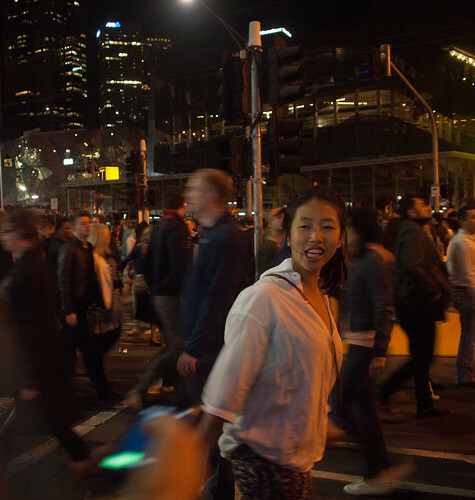 Then it was down Swanston Street until the crush of bodies brought me to a complete halt. It was like being in an overpacked subway station. For what seemed like hours, but was probably no more than a few minutes, nobody could move. I finally got to a side street and peeled off to make my way down to Flinders Station, the heart of the City. 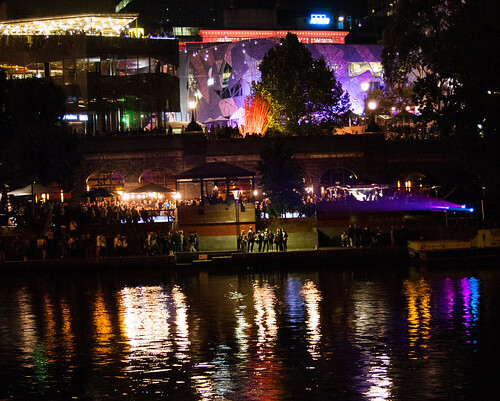 Once I was on the South bank of the Yarra, the hordes eased up. It is estimated that around half a million people made it into the CBD (Central Business District) for the Lorikeet coloured evening. Astonishingly, there were only ten arrests. But the police were not much in evidence where I wandered, so that could account for it. Needless to say, transport was a problem. I came down by tram, which stopped well before its normal destination at Flinders Station. Trying to get home about 12:30, the trams were jammed. I managed to get on the second one and a young man to whom I will be forever grateful gave this old guy his seat. A new piece in today’s “Age” suggests that “White Night” may be a victim of its own success. During the morning peak hours most train lines run services every 10 minutes or more often, trams more frequently. After the New Year’s Eve fireworks trains run at least every 15 minutes out of the city, with half-hourly services later in the morning. 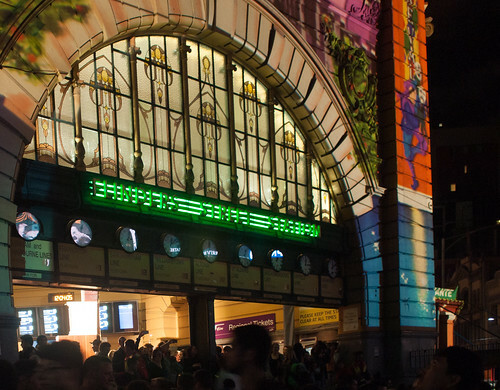 On White Night, passengers were expected to cram onto mostly half-hourly train services and trams every 20 minutes before 1am and then half hourly until morning. Thanks to the alarming accounts of Saturday night bar brawls spreading into the streets, I have long been wary of going into the CBD on Saturday night without having a specific destination. But White Night itself was remarkably peaceful and almost orderly. It was also spectacular and fun. Still, after the wait for the tram and the long ride home, I was very grateful to be back in bed. We have been cultural hermits of late, curled up with books or our favourite television shows. 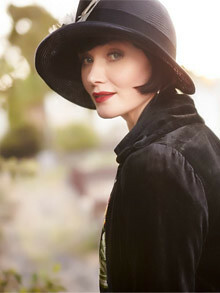 We are hooked on the second season of “Miss Fisher’s Murder Mysteries”, a home-grown detective show set in the roaring twenties in Melbourne. It has a wonderful cast, fabulous costumes, great cars and eccentric villains. Then there are the offerings on BBC IView, which I have discovered through the IPad and Apple TV. 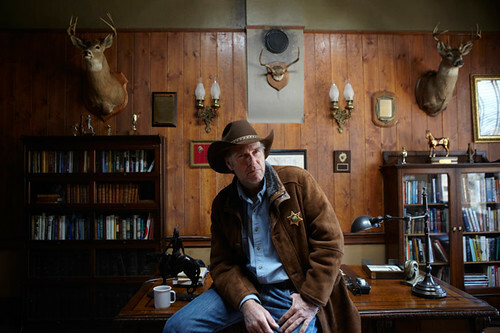 And thanks to the miracle of mirroring, we can now access one of our favourite shows– A&E’s recently renewed Wyoming Western– “Longmire.” Despite the lead’s ruggedly Western appearance and accent, Robert Taylor is a graduate of the West Australian Academy of Performing Arts. He hails from this part of the world. The Melbourne International Festival is going on, however. We have witnessed some wonderful productions at the Festival in past years, including a great Lithuanian production of “Romeo and Juliet” set in two pizza parlours. This year the offerings seem less compelling, but that may be because I’m simply not keeping up with the cultural shifts or the artistic director is less attuned to my demographic, or there are budget constraints, or a combination of all three. We did get tickets to one of the hottest new dance troupes to hit Melbourne in awhile– Hofesh Shecter’s troupe from the UK. His latest show is called “Sun,” a production my wife compared to Stravinsky’s “Rite of Spring. It was definitely loud and intense, discomforting and a little disorienting. Check out the trailer for the show and decide for yourself. It’s at: https://www.youtube.com/watch?v=gLjTbvasEzo. 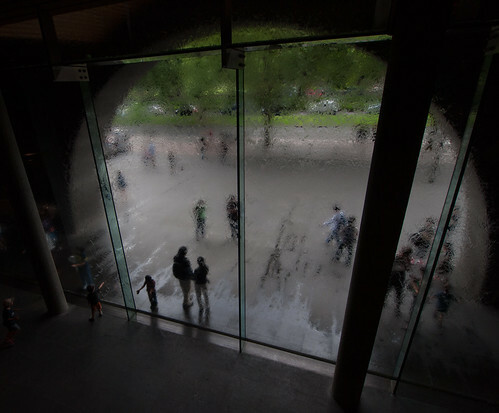 What captivated me more than anything else was an event I witnessed by chance, when I wandered around the wonderful water-wall at the National Gallery of Victoria to take some photos. 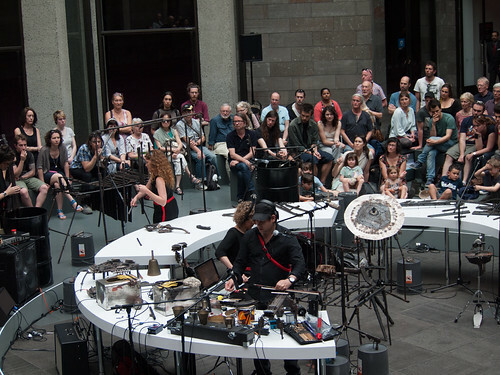 I arrived right before a performance of “music” on the oddest assortment of instruments I have ever seen. 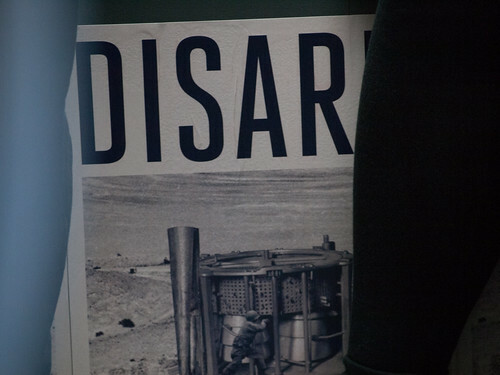 The event was called “DisArm,” for reasons that soon became obvious. Mexican artist/musician Pedro Reyes was already known for a 2008 project called “Pistols to Shovels,” in which he melted down 1,527 weapons to make the same number of shovels to plant trees. For “Disarm,” Reyes had a choice of about 6,700 guns that were turned in or seized by the army and police in Ciudad Juarez, a city of about 1.3 million people across the border from El Paso, Texas. In 2010, at the height of the drug-related violence in Mexico, the city averaged 10 killings a day. “DisArm” began with a phone call offering Pedro another chance to work with an arsenal of seized weapons. 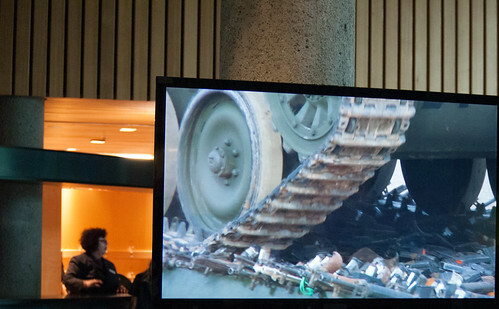 Drug-cartel violence cost more than 70,000 lives in Mexico over the last six years and the weapons trafficking has been a sore point; many of the weapons used by the cartels are smuggled across the border from the United States into Mexico. In 2012, then-president Felipe Calderon inaugurated a billboard in Ciudad Juarez which, facing Texas, spelled out the words “No More Weapons” in welded pieces of decommissioned guns. 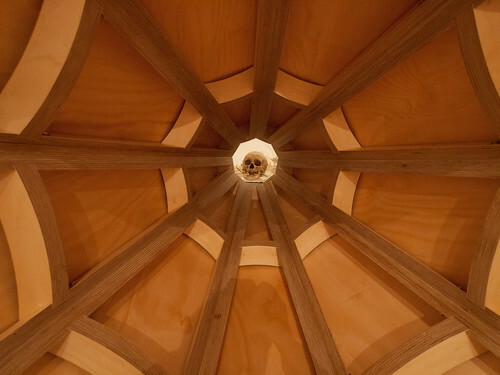 “It occurred to me to make musical instruments, because music is the opposite of weapons,” Reyes said. “This exercise of transformation we see with the guns, is what we would like to see in society.” “It’s important to consider that many lives were taken with these weapons, as if a sort of exorcism was taking place,” sculptor Pedro Reyes said in a description of his project emailed to The Associated Press. 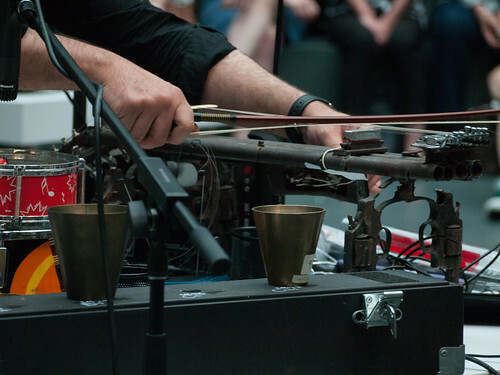 When they were played, he said, “the music expelled the demons they held, as well as being a requiem for lives lost.” As you might expect, the “music” produced on the ingenious instruments was anything but harmonious. It was loud, cacophonous and disturbing, like the lethal impact of the weapons themselves. But if the medium really is the message, “DisArm” has “Sun” and “Film” beat by a plowshare. Let me admit, first off, that I like theatre but I’m not a big fan of musicals. Some people may not see how it is possible to say that one likes theatre that does not include the singing and dancing kind. It certainly restricts the theatrical offerings, probably knocking out about ninety per cent of the plays on offer in London and New York. Despite my extended bout with the flu bug, I have not been entirely comatose during our stay here. 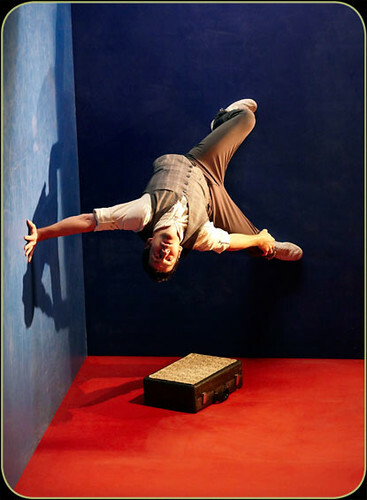 We were fortunate to have arrived in time for the London Mime Festival, which encompasses a diverse range of theatrical expression, from pantomime and circus-oriented acts to brilliant expressions of visual imagination. It is worth braving the wintry weather of January to sample the work of artists from all over Europe. I had purchased tickets to a reprise of a play at the National Theatre while a friend was visiting, but our friend was under the weather and my wife had came down with the flu before passing it on to me. 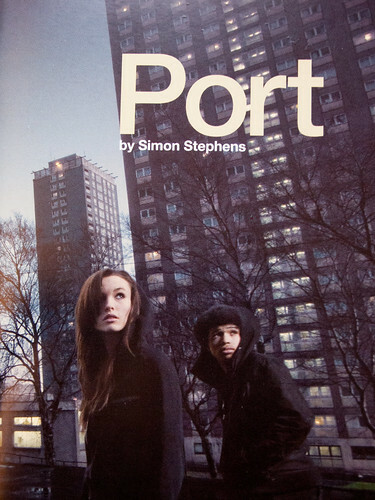 “Port” was a wonderful play, covering thirteen years in the lives of two troubled siblings, whose mother abandons them to flee her abusive husband and the bleak prospects of life in Stockport, a city in the Midlands. 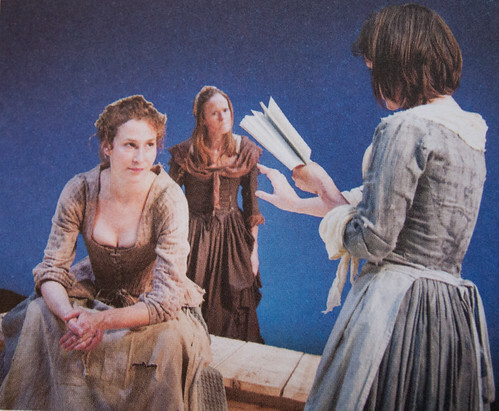 The text and performances were excellent and the scene changes seemed magical, one of the perks of having the National Theatre at one’s disposal. Our next theatrical night out was another reprise, this time the 25th anniversary staging of “Our Country’s Good,” based on the true story of the production by convicts in New South Wales of George Farquhar’s “The Recruiting Officer.” Timerlake Wertenbaker’s play, based on the Thomas Keneally book, was a hit when it first came out and continues to be widely performed. 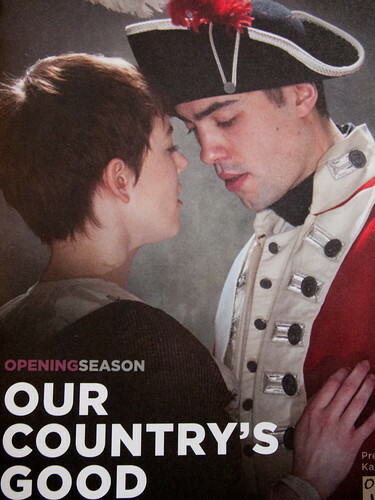 This particular production is stunning, from the arrival of the convicts in Australia to the opening night of the play. You are THERE, grappling with the emotional fireworks triggered by prisoners and officers who are psychically and sometimes physically shackled together, playing out their designated roles in this strange and hostile land. The staging of the play represents an escape from their roles as prisoners but it is threatening to their guards. 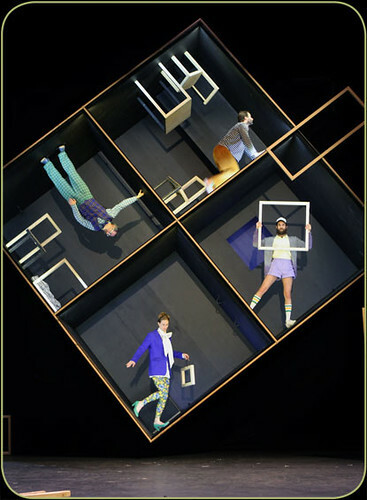 We first came across the work of Robert Lepage when we were living in Montreal. “Les Aiguilles et l’opium” (Needles and Opium) melds an experience from his own life (a failed love affair) with the entangled love lives and drug addictions of French surrealist author Jean Cocteau and American jazz trumpeter Miles Davis. Lepage played all three characters with captivating visual theatrics, including his suspension between 2 propellers, simulating a flight between Paris and New York. It was a brilliant piece of theatre. That hooked us. Two years ago we saw another production of his here in London– the Blue Dragon. In the Blue Dragon, the theatrical invention was there, but the text was less interesting than Needles and Opium. That alone could not have prepared us for “Playing Cards 1: Spades,” a truly dreadful play. The Boy Wonder theatrical alchemist who has succeeded on a global scale in theatre and opera has somehow failed to distinguish gold from garbage. None of the characters is real enough to make us care about his fate, and the elaborate staging in the round reminded me of a hokey circus or a video game. The play is set in Las Vegas, which says it all. My visits to London’s Art Museums have been similarly hit and miss. I have been to four photographic exhibits and a half dozen other art shows. 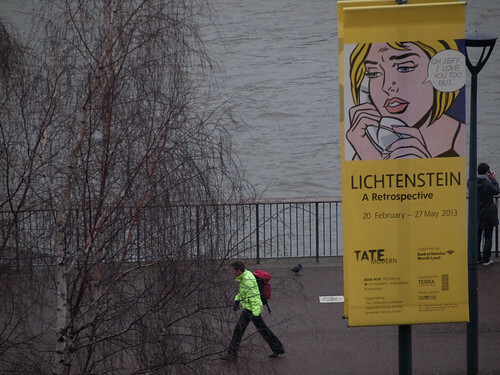 My last show, at the Tate Modern, was a retrospective of Lichtenstein. I came to the conclusion after wading through room after room that it was too bad he was so successful so early in his career. He never needed to explore much beyond Benday dots. The last room in the exhibit held a small selection of paintings that were done at the very beginning and end of his career, before and after his phenomenal success. Oil on canvas, brush strokes, vibrant and alive. 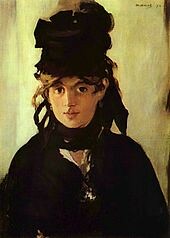 The Manet show at the Royal Academy is the one I would consider unmissable. It is the first major exhibition of this work in the UK, the first to focus on his practice as a portrait painter. “His elegant awkwardness of style, absolute honesty of vision, and persistent inovation and risk-taking established Edouard Manet the father of modern art.” This show was five years in the making and well worth all all the effort. For that alone, I am grateful to be in London. Our stopover in London on our return journey to Melbourne coincided with a conference for my spouse, and another opportunity for me to explore the city and see some fine art. London is a wonderful place to be if you are a museum hound. I was delighted to learn that there was a brand new exhibition of the work of Dale Chihuly on display at a gallery in Mayfair. 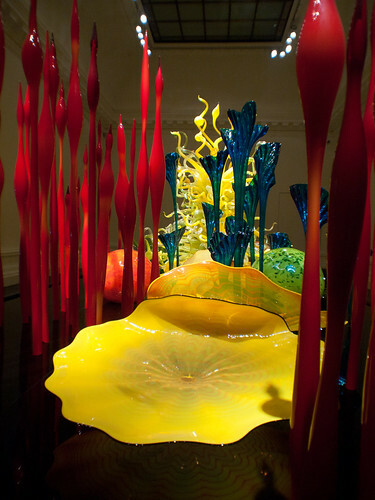 I discovered Chihuly’s amazing glass work at the Victoria and Albert Museum during our stay in London last year. An astonishing chandelier hangs in the foyer of the Victoria and Albert Museum. It is like a huge piece of jewelry, capturing and reflecting the colors of earth, sea and sky, rainbows and Northern light, of everything under our sun. My walk from Green Park tube stop took me through the posh streets of Mayfair, where the rich and famous must do their shopping when they are all out of Italian baubles. None of the stores I passed looked at all affordable, but there were very nice cars. 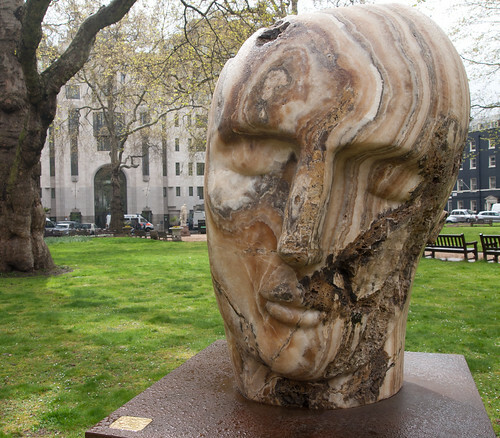 Just before reaching the gallery, I stumbled across Berkeley Square and spotted some large, stone sculptures decorating the green park in the Square. I wandered over and was struck dumb by the marble busts. 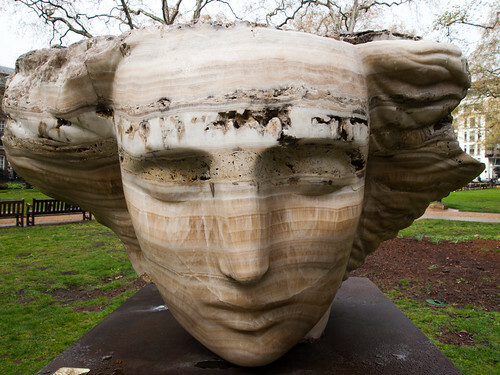 This was the work of Emily Young, an amazing British sculptor of whose work I was completely ignorant. So here we are, integral parts of the natural world, acting as natures’ agents, infinitesimally tiny players in the vast cosmos. In my particular little corner, when I carve a face into the stone, I seem to be acting out my self consciousness onto the stone, a stone that holds some of the history of the globe, formed of the very same original kind of material that I am formed of – a process begun billions and billions of years ago in the origins of our universe. I put a little modern consciousness back onto nature, who made both me and the stone. I carve the stone into familiar forms, carrying with them an emotional charge; the forms are beautiful, the stone broken. The expressions of sadness, of reflection, are easy to read – I like to think that anyone who ever lived on Earth, anywhere, any-when, would recognise these forms, and the expressions. The Earth is and has been so powerful, so wild, so completely the source and the surrounding of all that we are and are capable of – a long view of it shows it to be utterly beautiful and utterly rare. But our primitive respect and our physical sense of her honour is crumbling. And somehow we have become the gun that we shoot into the hearts of the innocent. We destroy, and as we destroy, we watch ourselves dancing and weeping on their graves. And so I protest, in stone; I want people to imagine what we will look like to posterity, how we would judge ourselves if we had such vision, and what we would do differently now: I want to speak down the years and tell the future of that bit of it’s past that was us – about what happens in our hearts now – about our surprise, our fear and sorrow, and shame – our apology. These pieces can be seen as memorials to a lost future, to lost wildernesses, to lost innocence; to the pointlessly, needlessly dead. 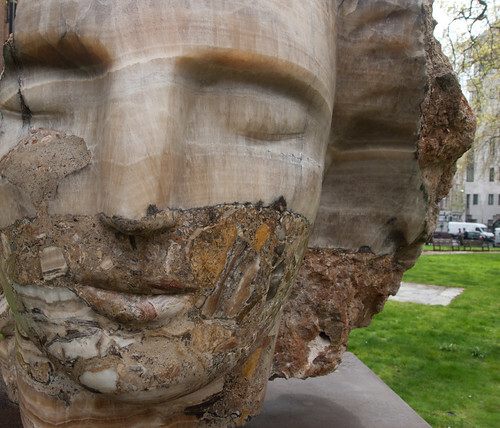 I was delighted to have stumbled across one of Emily’s exhibitions– “The Metaphysics of Stone,” six large stone heads emerging from the earth, speaking to us eloquently with long syllables of silence. 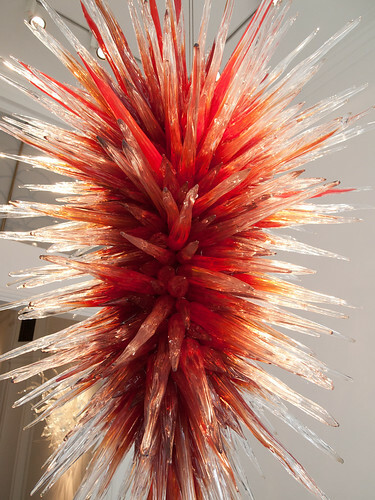 Chihuly, the American glass blower, seems like her human antipode. With a pirate patch over one eye, his manic work habits and powerful palette of colours, he offers up an exuberant vision that combines Las Vegas with Venice, the country fairground and the cathedral. To this day I have never gotten over the excitement of molten glass. 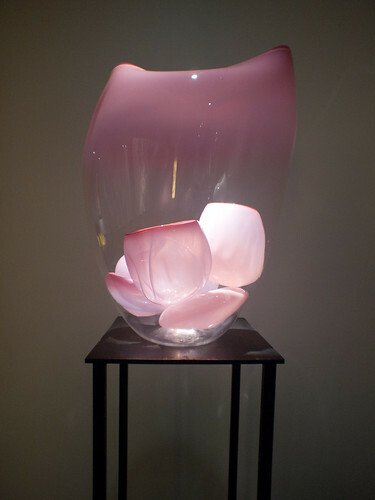 All the forms we’ve invented and developed are based on the ability of molten glass to be blown and manipulated in a very natural manner. We use as few tools as possible, and most of them are like the original tools invented two thousand years ago. The process is so wonderfully simple, yet so mystifying. I’ve watched thousands of forms blown and I’m still amazed to see the first breath of air enter the hot gather of glass on the end of a blowpipe. The piece is always moving while it’s in progress and one has to make decisions very quickly. 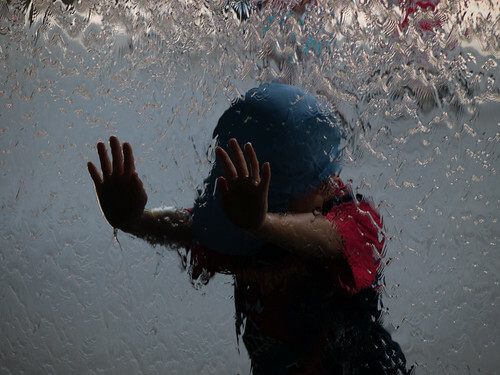 I like the work to reflect these quick decisions, the end result being a frozen fluid thought – as direct as a drawing. I’ve been such a nomad all my life, I don’t think I’ll ever lose the desire to travel to beautiful places – one more archipelago, another ring of standing stones, another glassblowing session in some exotic spot, or just one more trip to Venice to see the full moon over the Grand Canal. 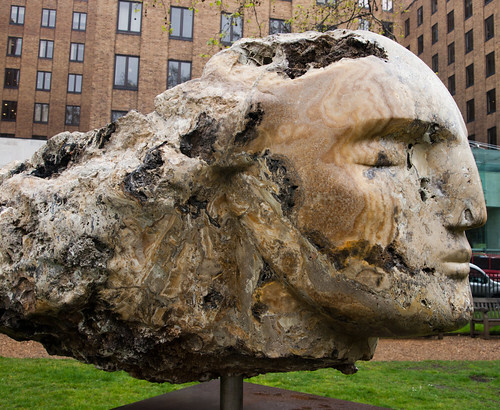 To me, the two artists are alchemists, turning the elements of the earth into magical form. I suspect they have more in common than is apparent from the contrasting nature of the work itself. I took a lot of pictures in the Halycon Gallery on Bond Street. Click on any pic running alongside this post and you can see the rest at Flickr. Unfortunately, the artworks themselves are no longer at these venues. Enjoy this show. I don’t know what possessed me, exactly, but a recent whirlwind tour of art museums may have been triggered by the simple purchase of a 3 day, Torino+Piedmonte card. It is a promotional gimmick that offers “free” entry to more museums than you can possibly see in 36 hours, free public transport, and discounts on everything from the opera to river rafting. We North Americans like we have to get our money’s worth. Turin is blessed with several collections of modern art that are dispersed around the city in some interesting buildings. The GAM was first on my list, since it is within walking distance of where we live. 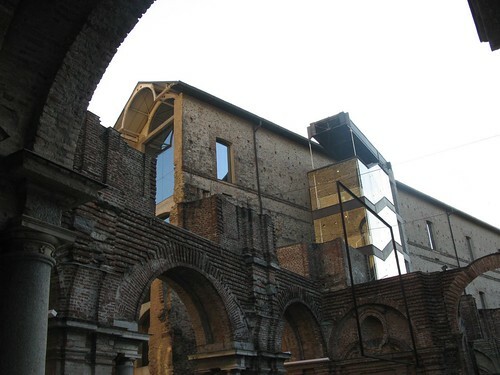 Its official name is the Galleria Civica d’arte Moderna e Contemporanea. It holds an extensive collection of art ranging from the late 18th C up to the present day. 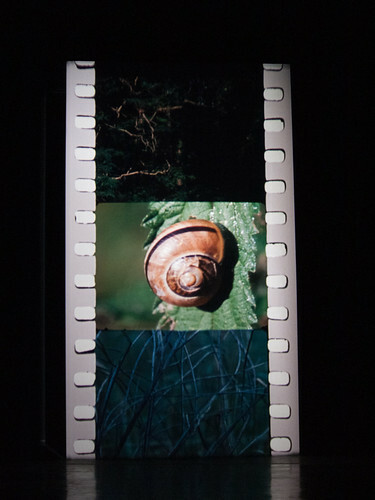 There were two ongoing exhibits, one on the designer, Enzo Mari, another on concepts of time and photography. Good for an afternoon. To get to Castello di Rivoli by public transportation, you have to take the subway to the end of the line and then figure out where to take the connecting bus. The museum is located 17 km west of the city at the head of the Susa Valley. Begun as one of the Savoy family’s residences, it suffered a series of major setbacks through its long history. Fortunately, it was rescued, imaginatively restored and re-opened in 1984. It is a stunning setting for an excellent collection. I made it back to the city in time for a tour of the luminous art installations currently on view in Turin, Luci d’art. The guide spoke French as well as Italian, but he naturally favored his Italian audience. A Belgian family and I got an abbreviated repetition at the end of each monologue. On Sunday I managed to squeeze in yet another exhibition at the light-filled, but warehouse-shaped building called Fondazione Sandretto Re Rebaudengo. 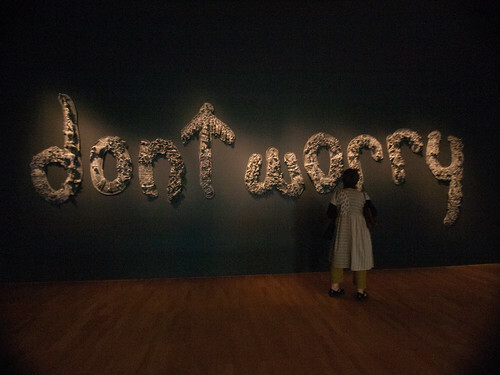 Most of the works were by Paul Chan, a Hong Kong based artist. Then I hoofed it over to the old Fiat factory. The Pinacoteca of Giovanni Agnelli is unique, perched like a Frank Lloyd Wright structure on top of the factory (now converted into a very popular shopping mall that is packed on Sundays). Nearby is the “Bolla,” an ultramodern conference hall that looks ready to take off. Surrounded by the rooftop test track, Agnelli’s elegant Scrigno (casket) holds a small number of paintings from his personal collection—Matisses, Canalletoes and a very nice Modigliani, in addition to traveling exhibits. Too much art in too few days. Basta! I have a headache already and I haven’t visited a single palace, church or the famous shroud. Ciao for now. After the exceedingly hot temps last Sunday (that we cyclists could have done without, thank you), it has turned chilly again. Today, the estimate is from 10 to 18 Celsius, or between 50 and 64 F. I have no idea what it was last night when I hopped the tram down to Federation Square, but it was damn cold. I expected to see a crowd in the thousands for a free Arts Festival event . Instead, maybe a hundred shivering souls showed up. Melbourne loves festivals, even more than Montreal. The Fringe Festival just ended. 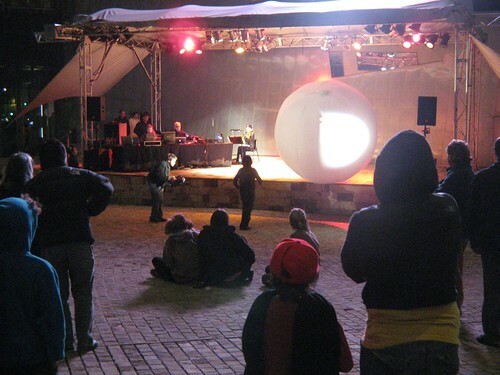 The Melbourne International Arts Festival is in full swing. Merce Cunningham is here with his dance company. Laurie Anderson performed a specially commissioned work called “Homeland.” Peter Brook is directing an Athol Fugard play. Attracted to familiar names, I bought tickets to a Canadian production of a play by John Mighton called “Half Life” and a new work by the Japanese Butoh group, Sankai Juku. I had never seen a Mighton play before, but had always liked the production company, Necessary Angel. I had vague, but favorable memories of a performance of Sankai Juku years ago in Los Angeles, probably soon after the company was founded 32 years ago. The play was well written and very well executed, but its exploration of old age seemed self indulgent and pedestrian. Unfortunately, my wife was heading off the continent the night of Sankai Juku. I talked my teenage daughter into going, thinking the costumes would enchant her. 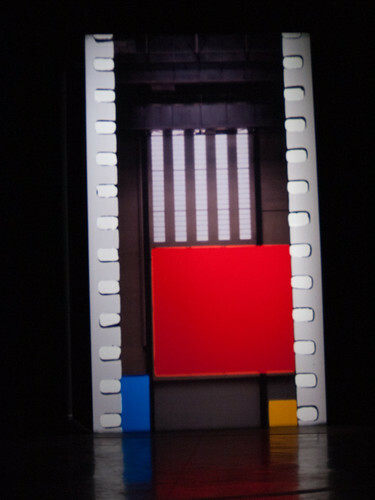 The dance was called Kagemi, beyond the Metaphors of Mirrors. It was slow and abstract. Compelling if you love the marvelous invention of choreography and the talent of the dancers. But there was no intermission. No chance for my daughter to escape. 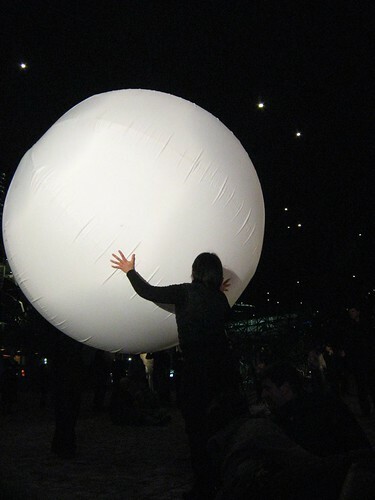 Last night’s performance was done for free in Federation Square. No one was trapped. Some people strolled through the performance space apparently oblivious to the art in progress. Some drifted off into the night. I was enchanted with the idea of the fabric globe but the execution of the piece seemed repetitive and less than inspired. 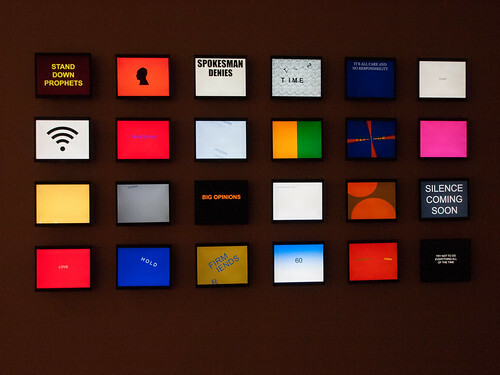 I was home in time to catch the new series on The Australian Broadcasting Corporation called “Not Quite Art.” The host is charming and very enthusiastic about all those activities that fall outside the scope of galleries and museums. 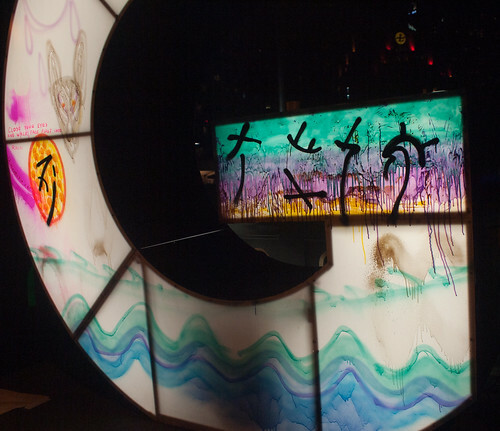 Last night’s show was about graffiti, which attracts Japanese tourists to Melbourne in droves. I haven’t given up. Call me a fool for art. There is the circus and La Clique, in the Famous Speigeltent. Stay tuned.